Hi everyone! 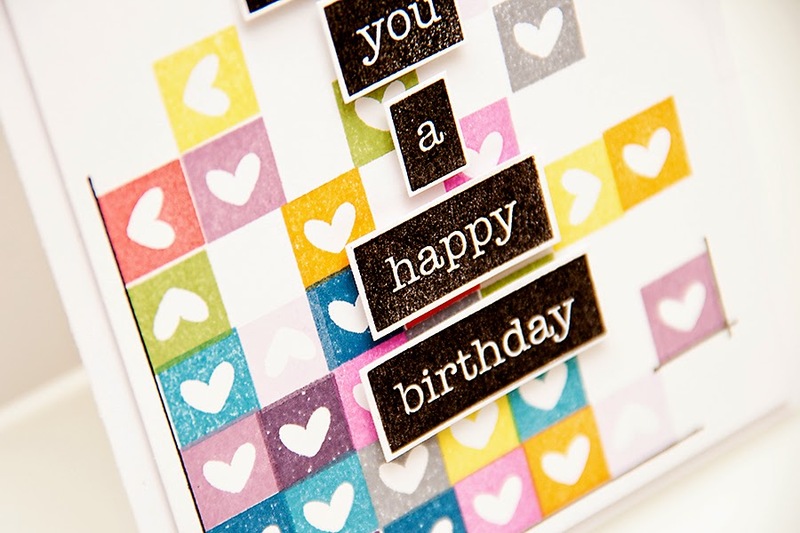 This is Yana sharing another Birthday Card idea with you. For this project I was inspired by a photo of a carpet (yes, that's right, a carpet) I found on Pinterest and I decided I wanted to try to create that color blocked look on a card. So I went looking for a tiny stamp that can be used for this purpose and found this adorable heart in the Everyday Labels set. I inked it up using various colors of ink (I used Memento Dew Drops from Tsukineko) and stamped it somewhat randomly to form a multicolored background. I also used other stamps from the Everyday Labels set to stamp my sentiment. To add some dimension to my card I used foam dots from Scrapbook Adhesives to adhere the black sentiment. To somehow frame my stamping a drew some lines using a black pen outlining a few of the stamped hearts. 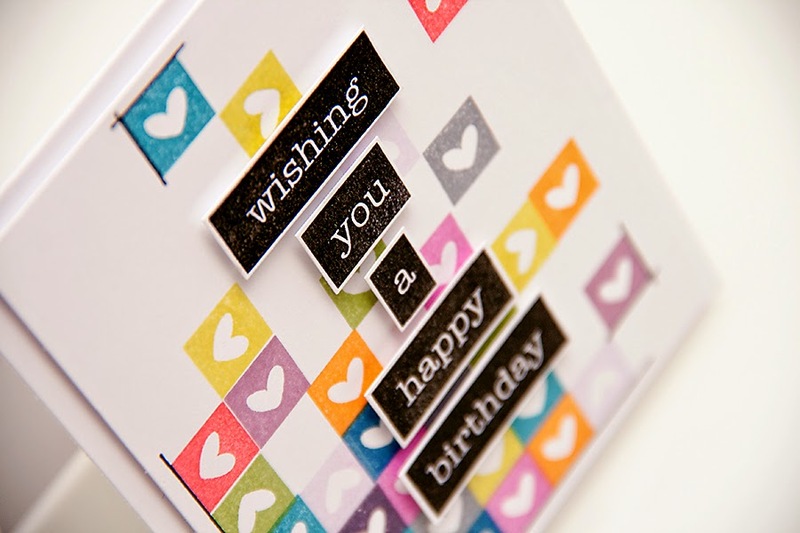 You can easily turn this card into a masculine birthday card if you use more muted colors, or a little girl birthday card if you go with a bunch of pinks and purples. Possibilities are endless here! This is so sweet! Love the stamping and colors! LOVE your video, Yana! 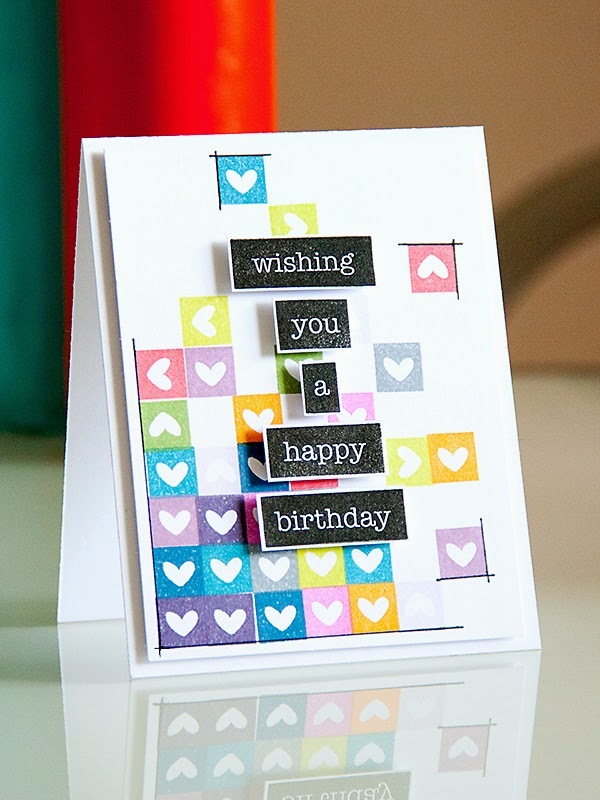 Love this creative way of using up the small heart stamp! Beautiful work!! Darling and very colorfully created. What a fun and clever design!